An EMF shielding canopy for your bed is one of the most popular radiation protection products on the market right now, and for a pretty good reason. EMF Blocking bed canopies provide a safe haven for you to sleep in and give you a more restful, healthy, and peaceful nights sleep. When my wife and I began sleeping under one, we couldn’t believe the difference we felt. So I felt like it was finally time to tell you a bit more about how these canopies work, the best ones you can buy, and answer any questions you might have about them. Let’s start by talking a little bit about what they are. What Exactly Is An EMF Shielding Canopy? An EMF Bed canopy, like any bed canopy, is a large piece of fabric designed specifically to completely cover the bed you sleep in. However, unlike a normal canopy, an EMF canopy is made out of a special fabric that will block nearly all electromagnetic frequencies. So, understandably, finding a way to protect ourselves while we sleep is extremely vital. Nearly all of these canopies are made out of one of a few possible special fabrics, such as Naturell, Daylite, or Blocsilver. All of these are made up of a large percentage of real silver (hence the fairly high price tag), which is what allows them to block EMF radiation. 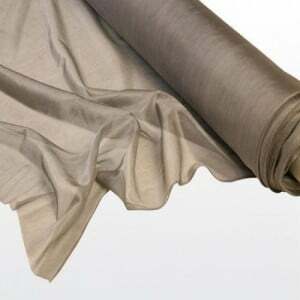 The silver is usually threaded with either cotton, such as the Naturell, or with polyesters, such as the Daylite or Blocsilver. Now that we know what an EMF canopy is, let’s talk a little bit about why you may want one. Why Would I Want An EMF Shielding Bed Canopy? If you haven’t had a chance, I’d encourage you to take a quick look at my guide on How To Eliminate EMFs In The Bedroom for a ton of information about why protecting your bedroom from radiation is so important. Suffice it to say, our bodies are especially vulnerable at night, as they are regenerating cells, detoxifying the blood, and fighting off illness and disease. Sleep is extremely important for our health, and unfortunately, EMF radiation has been directly linked to sleep problems. The main reason this happens was revealed in a study conducted by the Department of Electrical and Electronic Engineering at The University of Melbourne. The study showed that exposure to EMF radiation from things like your cell phone, smart meters, WiFI, nearby cell towers, and much more, impedes our bodies ability to produce and maintain levels of melatonin. As you may know, Melatonin is the hormone that regulates the quality, and quantity of our sleep. Melatonin has also been known to fight aging, ward off disease, and even improve libido. The reason that the body produces less melatonin in the presence of EMF radiation, is that our bodies recognize the electrical component, and sense it as light. Sensing light, our bodies do not believe it is time for sleep, and therefore reduce melatonin production to help keep us awake. That’s why getting an EMF shielding canopy can be so vitally important, it entirely protects our bodies while we sleep, and also dramatically improves our sleep. My post about reducing EMF radiation in the bedroom gives tons of great tips about things like keeping your cell phone off your nightstand, turning off your WiFi, etc. All of these tips can be bypassed by just getting an EMF shielding canopy for your bed. Take a look at the short video below to see the EMF radiation blocking capabilities of these canopies in action. Now, unfortunately, these canopies are not inexpensive. However, since we spend a third or more of our lives in our bed, getting a canopy like this is one of the absolute best investments you will ever make for your health and well-being. At least, that is certainly what my wife and I concluded. There are a few places you can get these canopies, but the one my wife and I went with is this one, which you can get for any bed size on Amazon. I truly believe that EMF canopies are for everyone, but there are some people that I believe they are even more crucial for, and that is those with electromagnetic hypersensitivity (EHS), and children. Let’s talk a little bit about why each is so important. People that suffer from EHS exhibit physical, and very real, symptoms from exposure to EMF radiation. I’ve written a full post on EHS called “EHS Disease – Do I Have It?” that I would encourage you to check out if you don’t know much about this. Essentially, individuals with EHS suffer extreme versions of common EMF radiation exposure symptoms, and they also will experience them at much lower levels, and from much less total exposure. Individuals that have EHS often get headaches when walking under telephone lines, feel sick in homes with WiFi, and get dramatic tingling in their hands when typing on a laptop and much more. For these people, an EMF shielding canopy is one of the absolute best things they could possibly have. I wrote an enormous 5000-word definitive guide to protecting your entire home from EMF radiation. However, even this guide will not be able to eliminate EMF radiation exposure from all sources. So having at least one place where you aren’t exposed to radiation from cell towers, power lines, neighbor’s WiFi, smart meters, 5G implementations, and other sources of ambient radiation are so vitally important. 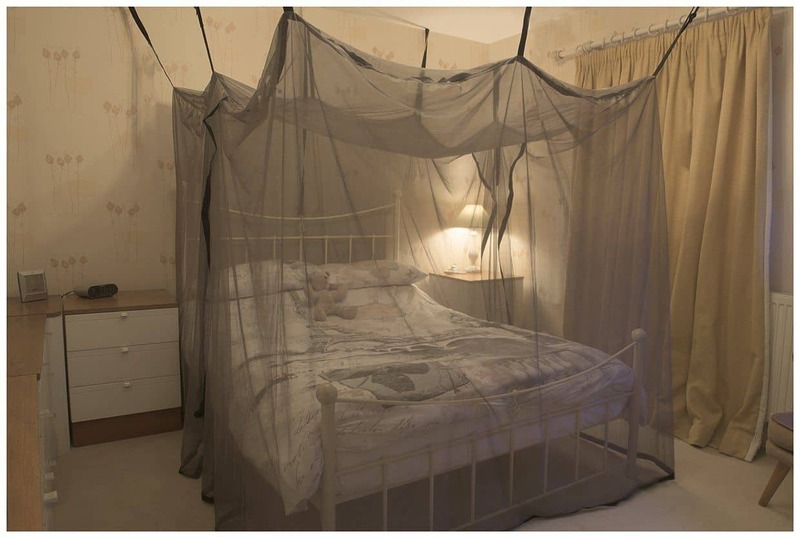 People who have installed these type of EMF radiation blocking nets around their beds have said that they slept better, reduced headaches, reduced feelings of tingling, and dozens of other symptoms they felt. For these individuals, their beds can become a bit of an oasis in our digital desert, protecting them completely and giving them relief that they can’t find anywhere else. Their brains are still developing, and therefore the cells are more vulnerable to improper creation and replication under the stress EMF radiation causes. Their skulls are thinner and attenuate (or reduce as radiation passes through an object) less EMF radiation from getting to the brain. My wife and have a little girl, and one of the few things I insisted on when we were shopping for things for our nursery was a canopy for the crib. Luckily, they make simple small ones for cribs and children’s beds. The nice thing about this is that since the canopy is still see-through, we can (although we don’t currently) have a video monitor in the room and not have to be worried about the EMF radiation from it, or from other devices in the room. 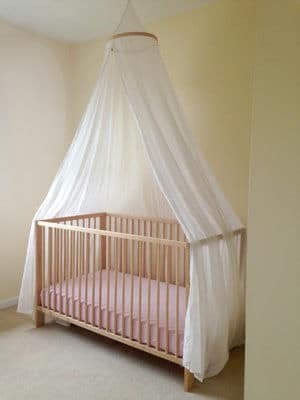 Where Can I Get A Canopy For A Crib Or Childs Bed? Luckily, Blocsilver, who I recommend for adults, also makes a bed specifically sized for a crib or small bed. It is less expensive because it is smaller. Even better, you can pick it up on Amazon. Ok, now that we’ve talked a bit about what these canopies are and why you would want one, let’s answer some of the other common questions. What About Radiation From Underneath The Bed? Great point! If you watched the video above, that was taken without any protection under the bed. This shows that these canopies on their own are capable of dramatically reducing the radiation. However, they do make EMF blocking floor mats that go underneath the bed. They are made large enough to extend beyond the dimensions of the bed so the canopy can rest upon them, which completes the “Faraday cage” effect and will allow you to block essentially 100% of EMF radiation. These floor mats are especially important if you sleep in an upstairs bedroom. They are even more important than that if below your bedroom are things like WiFi routers, electrical panels, smart meters, etc. If you want the absolute most protection possible, it is certainly worth the investment to get a protection mat to go underneath your bed. How Will I Know If The EMF Shielding Canopy Is Working? 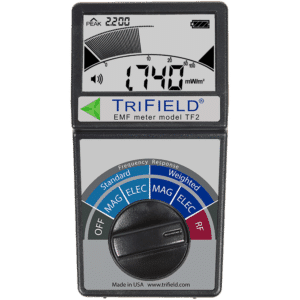 This applies to almost anything that you want to test, but you first need to start by getting a high-quality EMF meter. I personally use, and love, the new TriField TF2 (read my review). It is super easy to use, incredibly accurate, and measures every kind of EMF radiation, which you’ll realize is really important. If you need to start with a lower cost version I also like the Meterk (read my review). Having a quality EMF meter is one of the absolute best things you can do if you are at all concerned about EMf radiation. Not only will you be able to discover for yourself what kind, and how much, radiation is being emitted from various devices around your home, but you will also be able to more effectively implement solutions and know they are working. When it comes to testing to see how well your EMF shielding canopy is working, the process is actually quite simple. First get a reading in the room outside the canopy. Move around a bit and try to find an average around the canopy. Then, get inside completely and close the sheet. Then, find another average and I think you’ll be pretty amazed at just how big the difference is. Do EMF Shielding Canopies Need To Be Grounded? Another great question, you’re on fire! Yes, ideally they should be grounded. The Blocsilver Shielding Canopies I’ve recommended in this post come with a simple grounding cable for exactly this purpose. One end is a simple crocodile clip, and the other end can simply be plugged into a wall socket. Now, these canopies will still work without grounding to my knowledge, but for the best use, you should ground them if they are intended to be. Do They Make EMF Shielding Canopies For Any Size Bed? They Do! For your convenience, I’ll go ahead and put links here to all the different sized beds. These are all great choices, just be sure to get the right size for your bed. Can I Make My Own EMF Shielding Canopy? You Can! In fact, I’ve known people who have done exactly that and saved some money. Blocsilver, the same company that makes the canopies that I recommend, also sells just sheets of the fabric that you can purchase on Amazon. They come in sheets that are 10 ft. by 5 ft., so be sure that you get enough for the project by measuring it out ahead of time. For the amount of fabric you get, this is a much less expensive option, but you won’t get the convenience of it already having been sewed and sized correctly for your bed. What Should I Do About When I Travel? If you are sensitive enough that you are worried about how radiation in other environments might affect you while traveling, I’m not sure a canopy is a great choice for that. I would just get an EMF protection sleeping bag (check out my full guide on EMF sleeping bags). These are essentially just meshed, see-through, breathable bags made of similar materials that are comfortable enough to sleep in. You will have just as much (or possibly more) protection inside of one, so they are a great choice for traveling. I honestly think that these are a fantastic investment for most people if you are able to afford it. These canopies certainly provide an enormous amount of protection from EMF radiation at our most vulnerable time, while we are sleeping. However, if you are unable to afford one, there are certainly plenty of less expensive ways to reduce radiation in your life that I would absolutely recommend. I would start by checking out my huge guide on How To Eliminate EMFs In The Bedroom, which gives you a ton of free and inexpensive advice on lowering EMF radiation while you sleep. I really hope this guide was informative for you, if it was, please consider sharing! Can You Get RF Shielding Materials At Home Depot?